A 3D scanner uses laser technology to determine the dimensions of an object and create a 3D printable model. The device can also take multiple scans and combine them into a more precise approximation of the object. 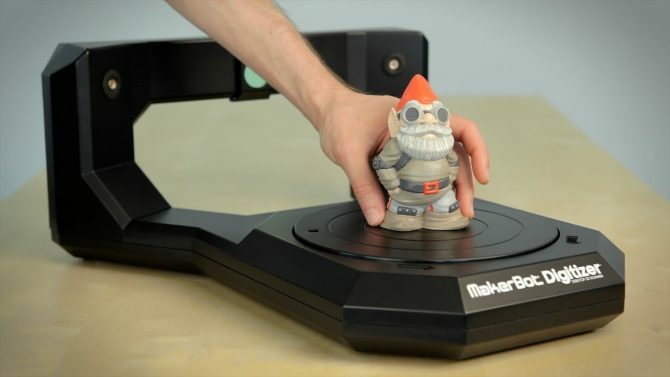 Learn the basic functions of our MakerBot Digitizer Scanner, scan an object multiple times, then 3D print it. Sign up now to earn the 3D Scanner badge. Earning the 3D scanner badge allows you to reserve the 3D scanner to build your own projects in the MakerLab. In exchange for use of the machine in the lab, you also agree to also share information about your project with curious customers.